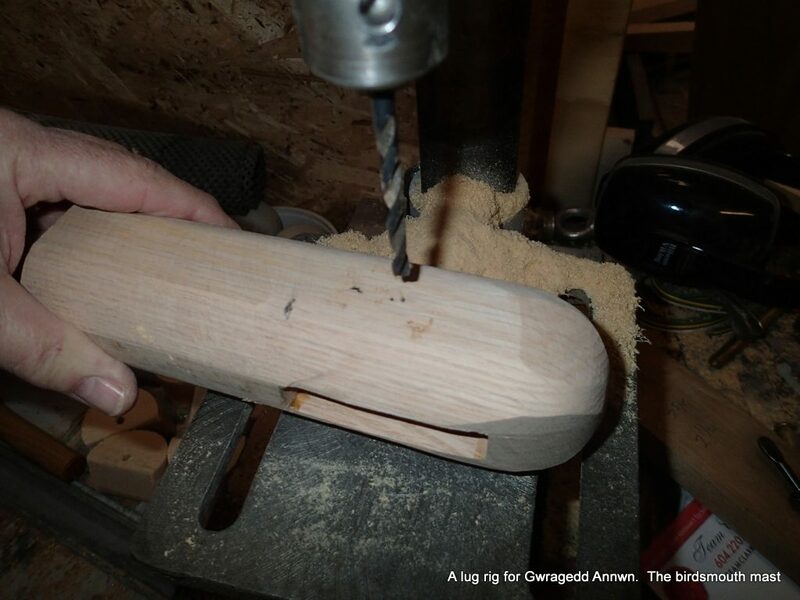 Fitting & shaping the Masthead Sheave Plug. The glue has dried enough for me to work on the masthead sheave plug. 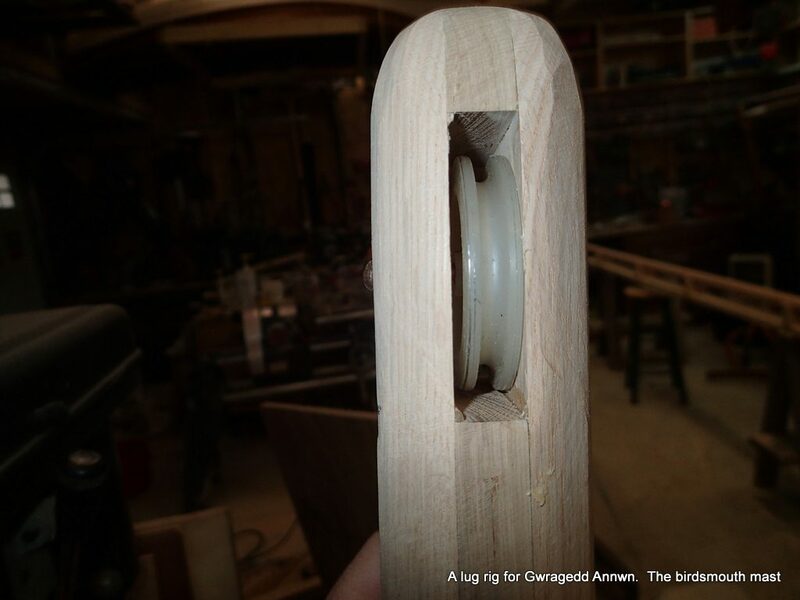 I rough cut the shaft, giving it eight sides, I fine-tune the fit using my Shopsmith 12″ sanding disk. Back and forth from the mast to the sanding disk until I get a good fit, Part of the problem is that the mast, due to the taper, is actually gets bigger on the inside as you go down. To solve the increasing inside diameter issue, when I epoxy the masthead plug in, I will stand the mast on its head, the epoxy will flow down around the masthead plug shaft, filling any gaps. 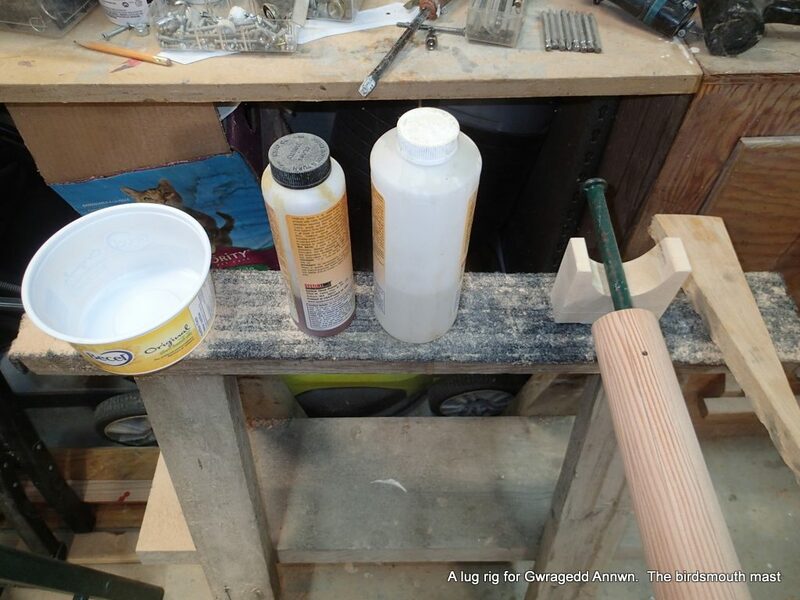 The procedure will be to push an “epoxy plug” into the mast, (remember, the mast is filled with crumpled aluminum foil) pour in epoxy & wood dust mixture, tape around the joint, stand the mast on its head, The epoxy & wood dust will flow down around the masthead plug. I have 17″ of height to the peak of my garage roof, so my mast will just fit. 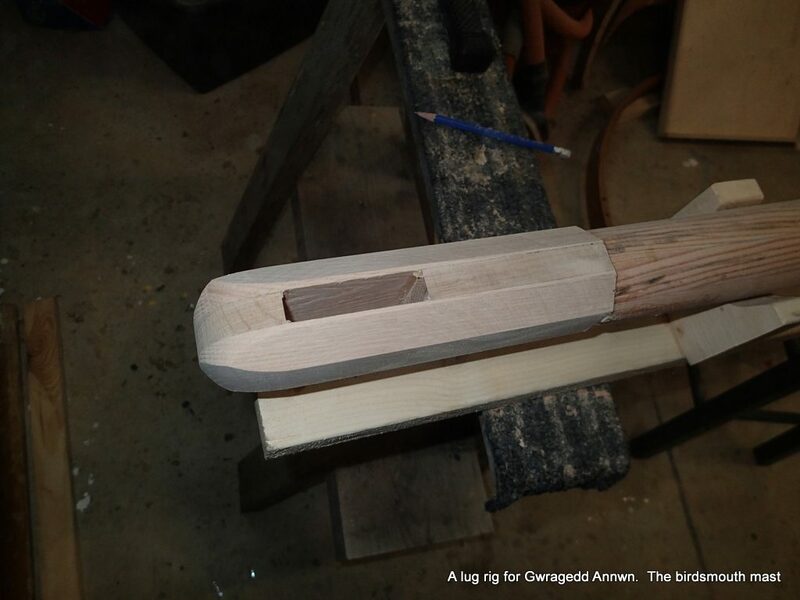 Snug fit for the masthead plug shaft. 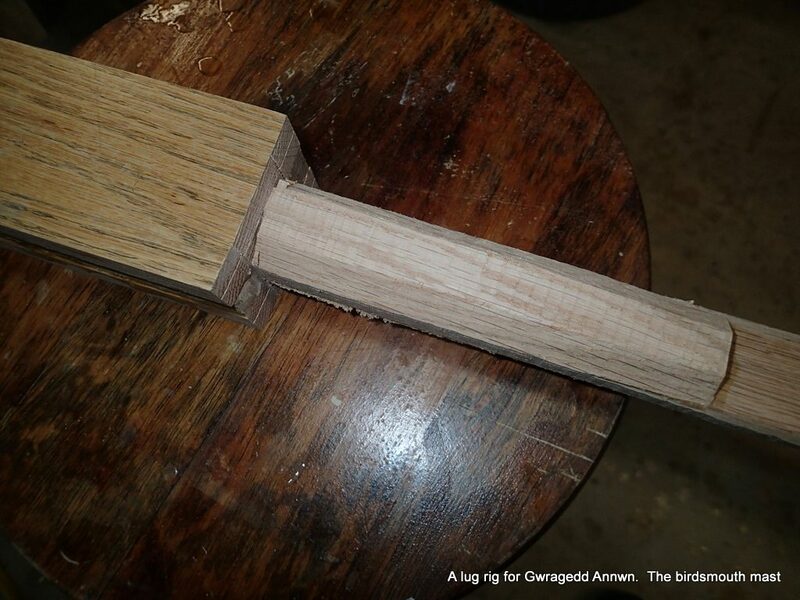 Before I get too far, I will drill the plug for the masthead sheave…using one of the flat surfaces. The drill bit is the same diameter as the sheave axle hole. Test fitting of the masthead sheave. 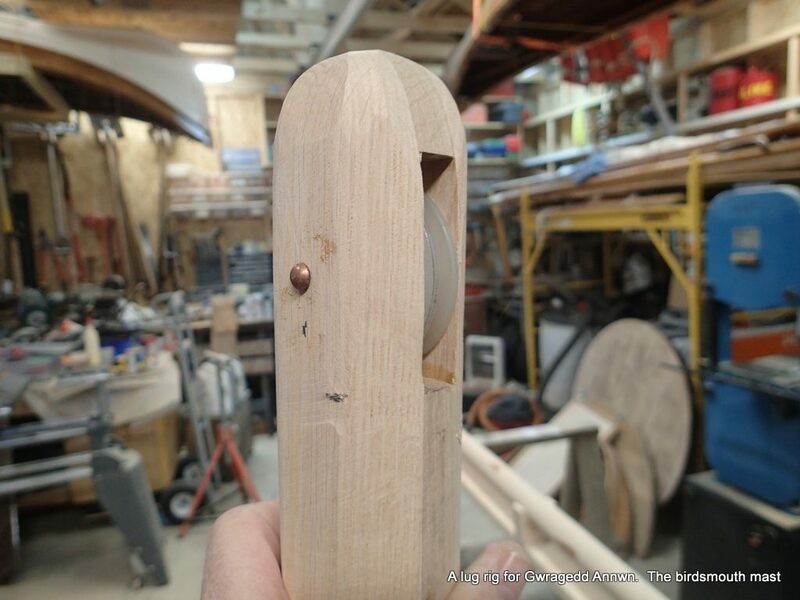 The final install will have stainless steel (maybe copper) washers to hold the sheave in the middle of the slot. I would like to use a copper rivet to hold the sheave in. 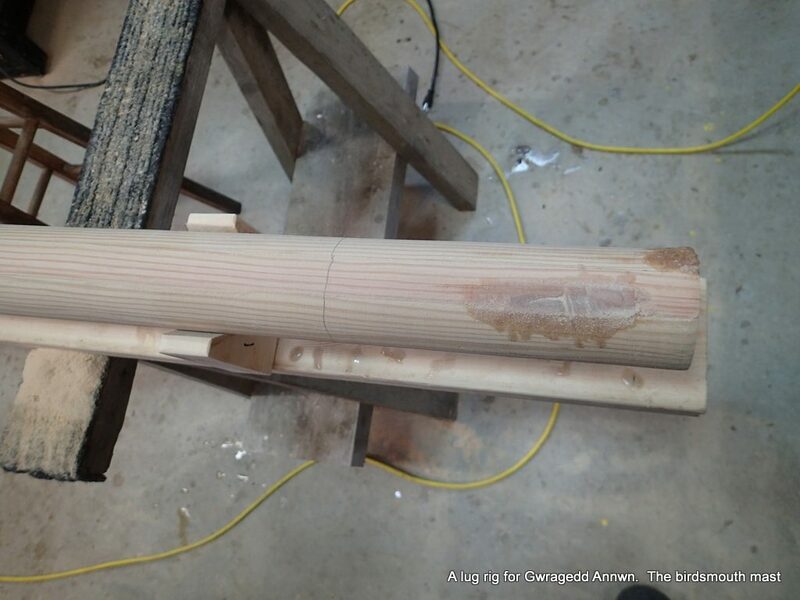 When I made the mast, I used a belt-sanding jig to round the mast. 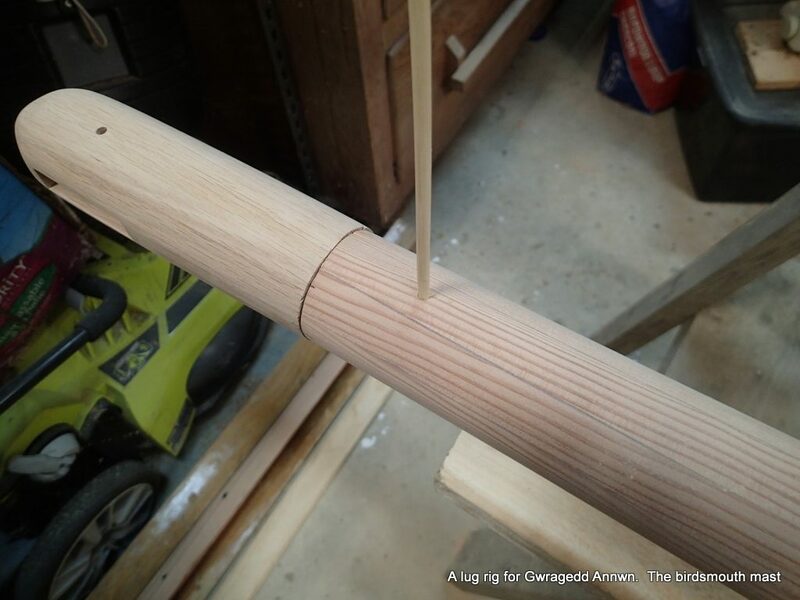 The result was a round mast, but there are lots of cross-grain sanding marks. 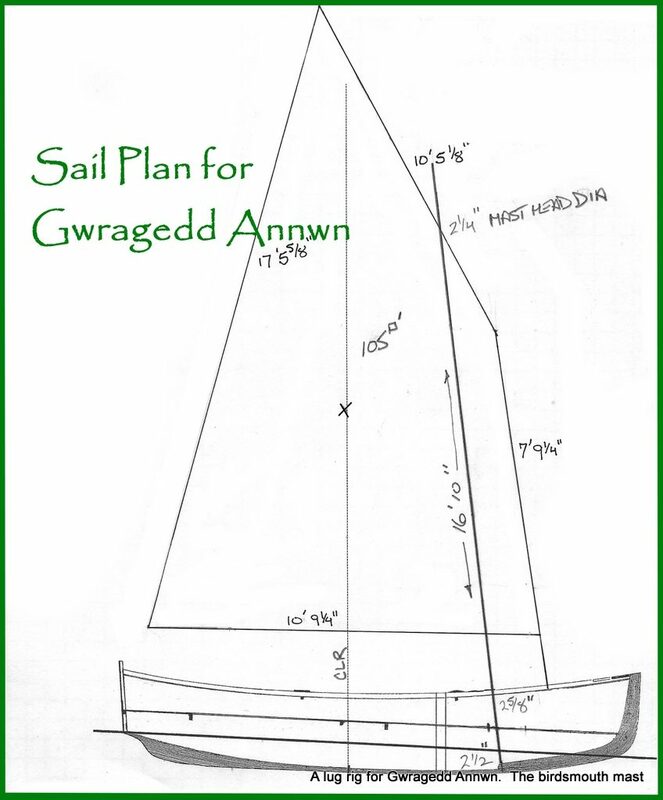 I am going to now re-sand the mast, with the grain, to end up with a smooth finish. 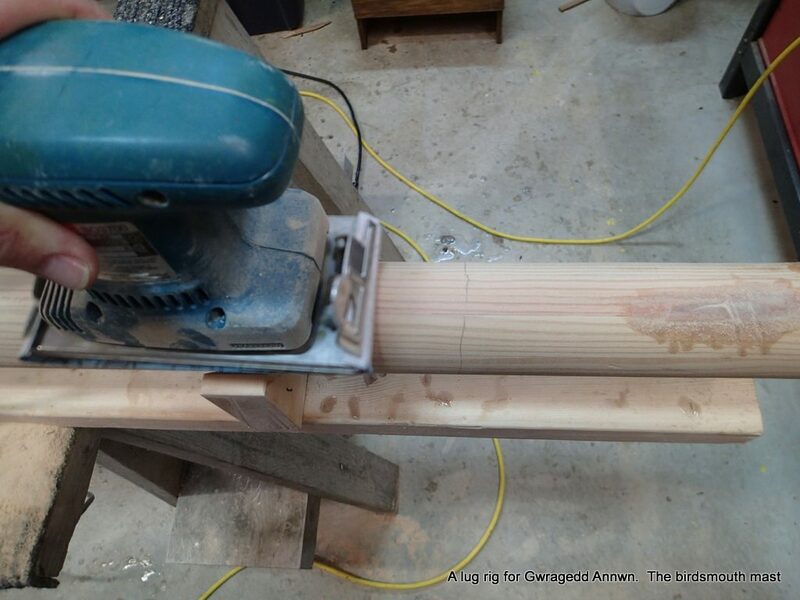 ⅓ sheet random orbit sander with 80 grit sandpaper. 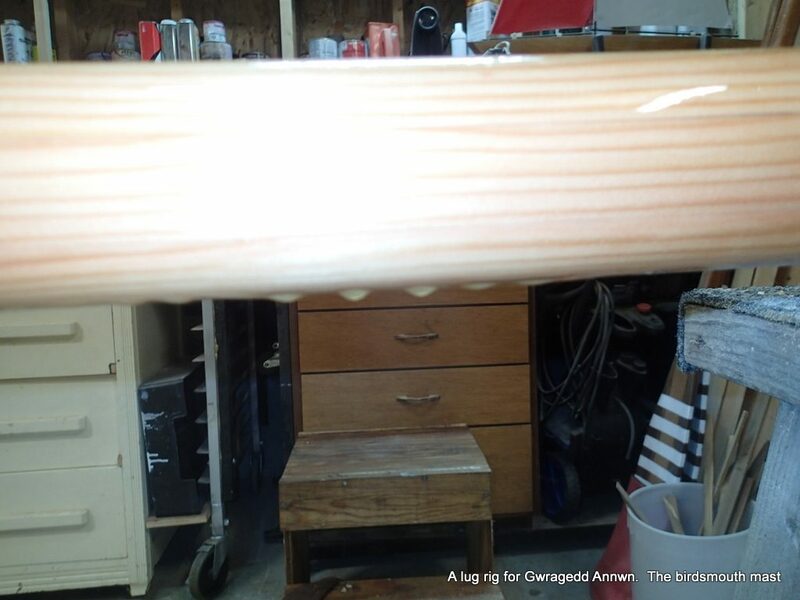 The lump in the upper right of the above photo after sanding. 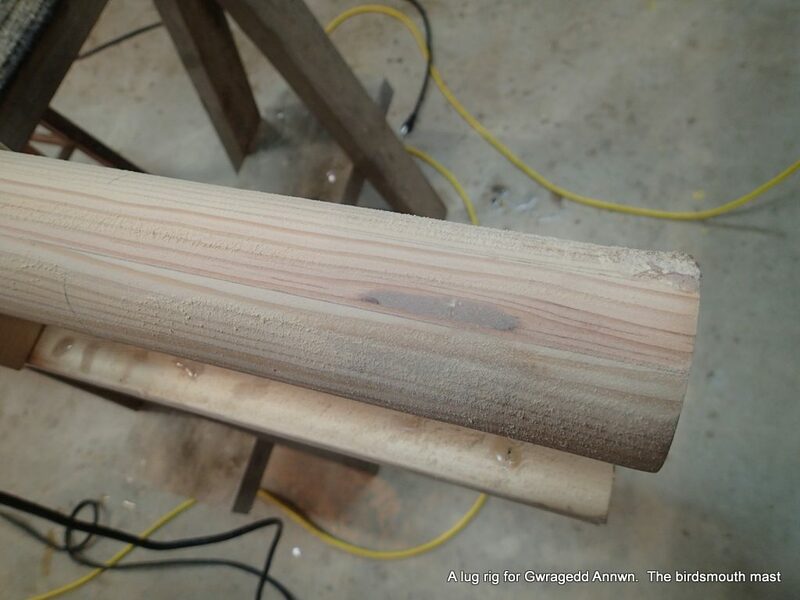 This part is where I “sand-off” an afternoon…the procedure is to move up and down the mast, sanding as I go…Each stave takes maybe 10 passes of the sander to sand off the cross-grain marks. After I have sanded the mast with 80 and then 150 grit, I pin the masthead plug to the top of the mast and sand it flush with the mast. 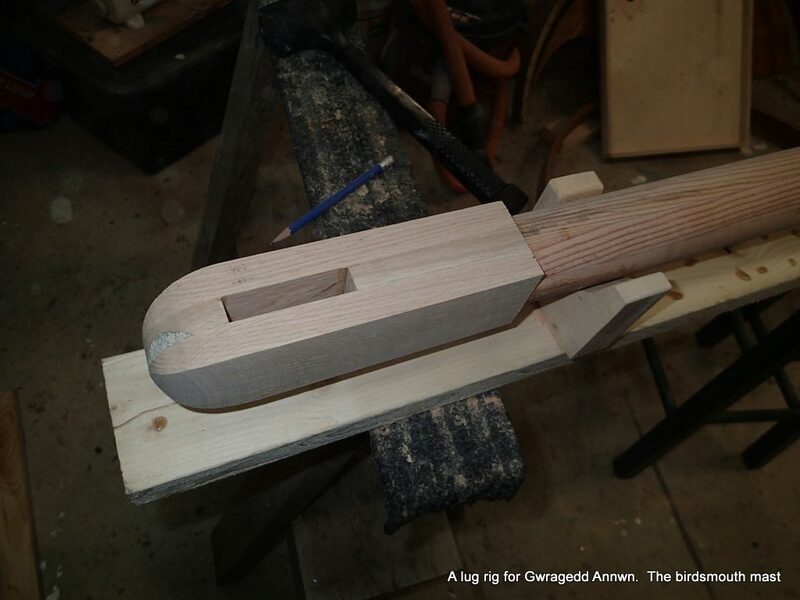 Masthead plug faired and sanded. 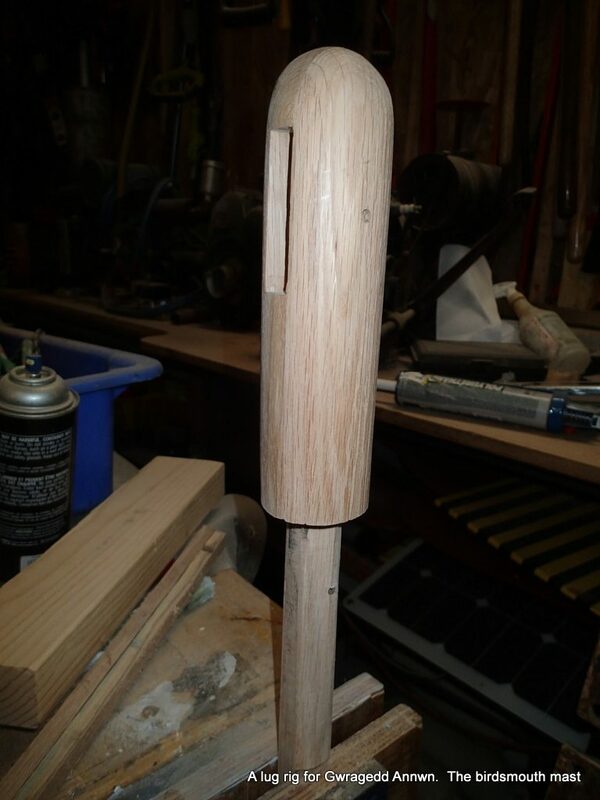 I now brush off the sanding dust and vacuum the mast & masthead plug. ‘poxy time! Cold Cure resin. I take out the Masthead sheave plug to epoxy separately. I re-arrange my mast supports, one on each end. 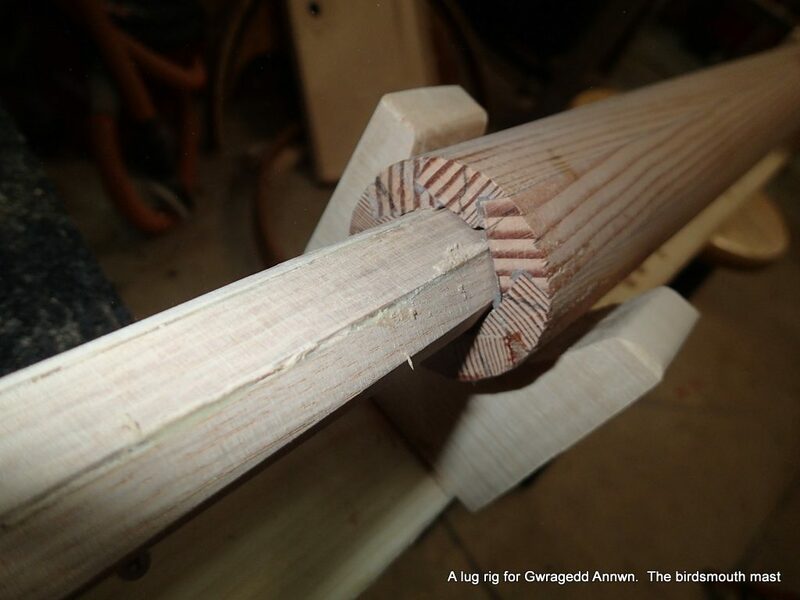 I use a metal bar, inserted into the top and bottom of the mast to hold the mast in the brackets. This way I can rotate the mast and epoxy all its sides. 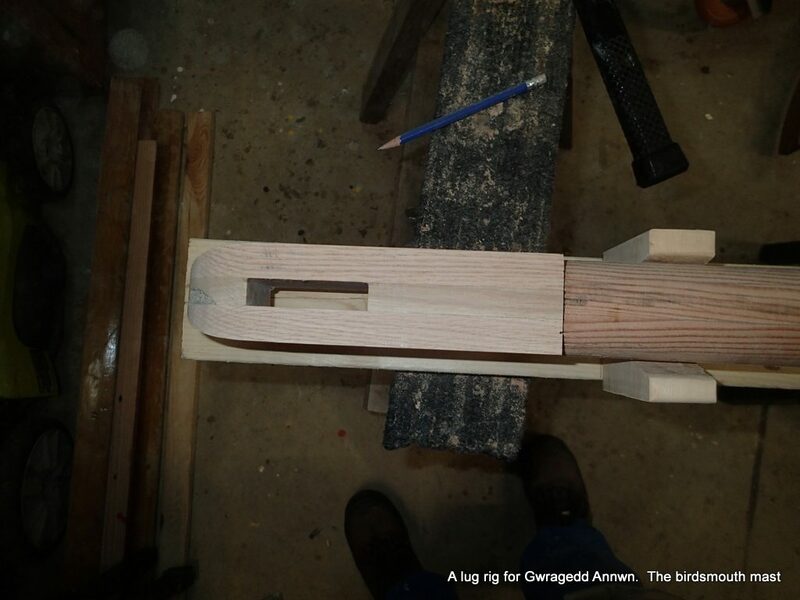 I clamp the Masthead Sheave plug in a vise to give the top part a coating of epoxy. I will not epoxy the shaft and the bottom of the plug. 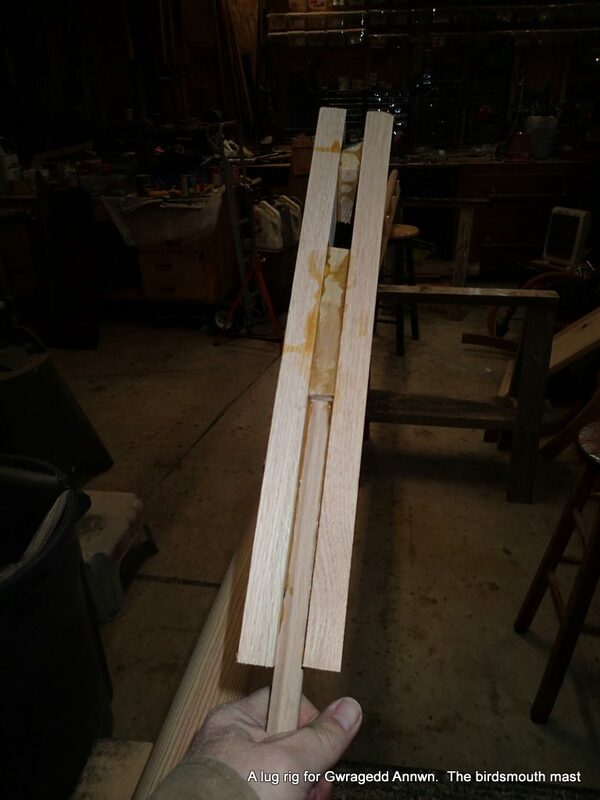 When I epoxy the mast and the plug together, I want the epoxy to soak into the wood on both pieces. 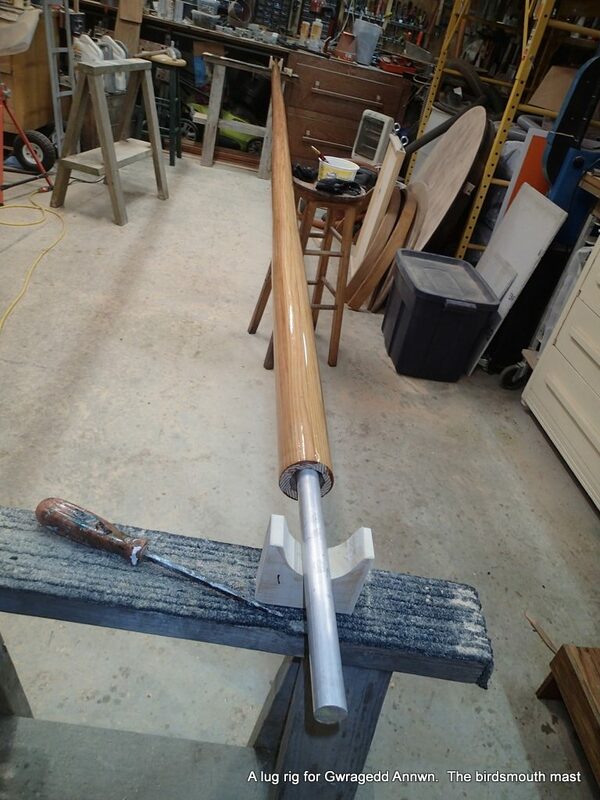 I am epoxy coating the mast for two reasons. 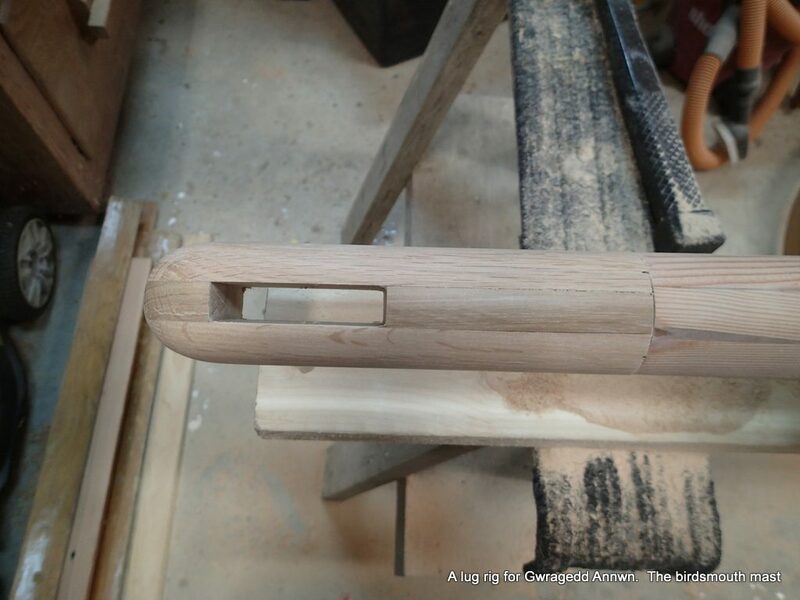 One: While sanding the mast I had noticed that some of the joints were not filled…the was sanding dust in the joint. 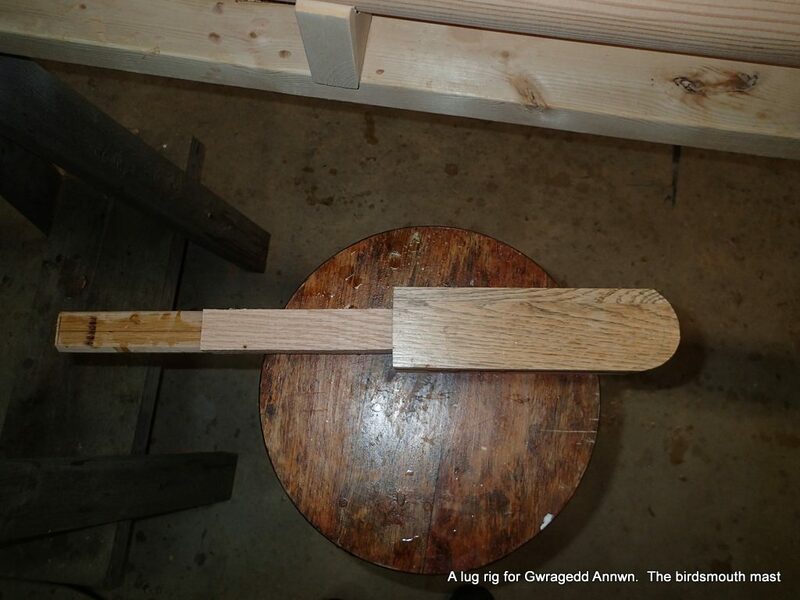 To insure that all of the mast stave joints are epoxy filled, and Two: to seal the wood so no water will be absorbed. 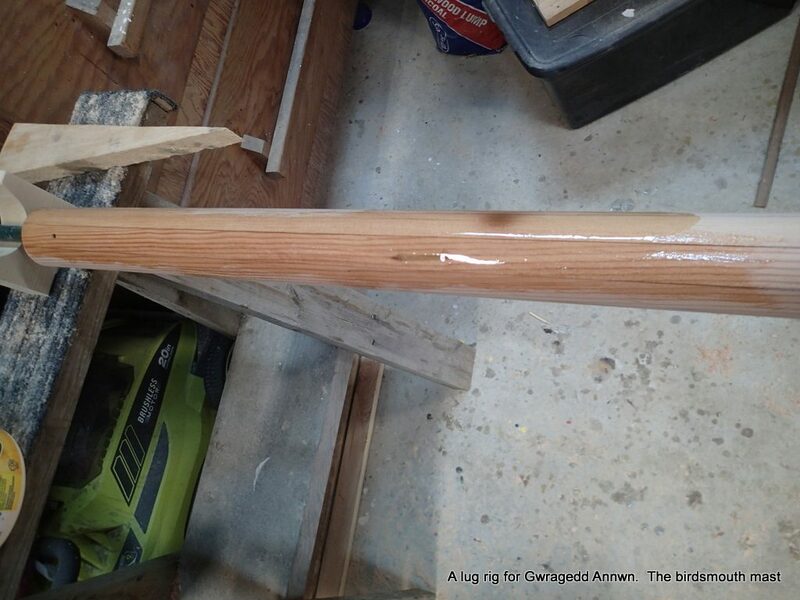 The mast is coated with epoxy resin. My solution to drips is to rotate the mast 180° and then brush the drips out. I rotate the mast every 30 minutes until the epoxy is too set for the drips to form. I also brush off the drips that have formed on the Masthead sheave plug. 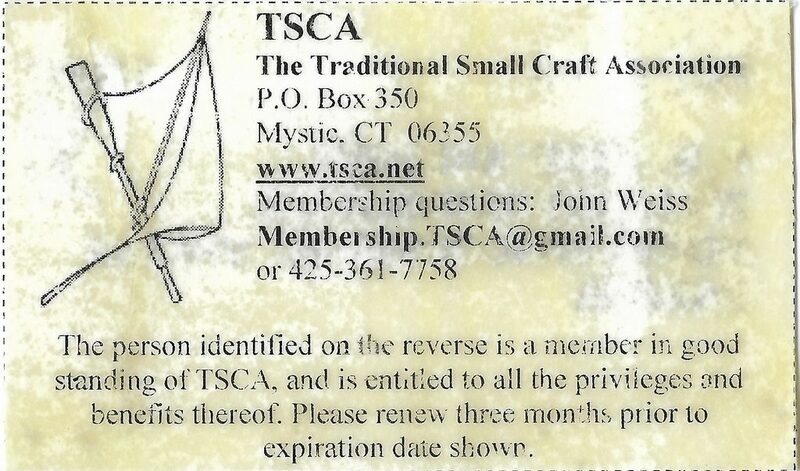 A Note: after turning my mast a few times, I decide to epoxy coat my Traditional Small Craft Association membership card…I just got it in the mail today. The epoxy is now a little stiff, and does not flow over the card evenly, but now the card will last forever. TSCA is a great association, you should join too. 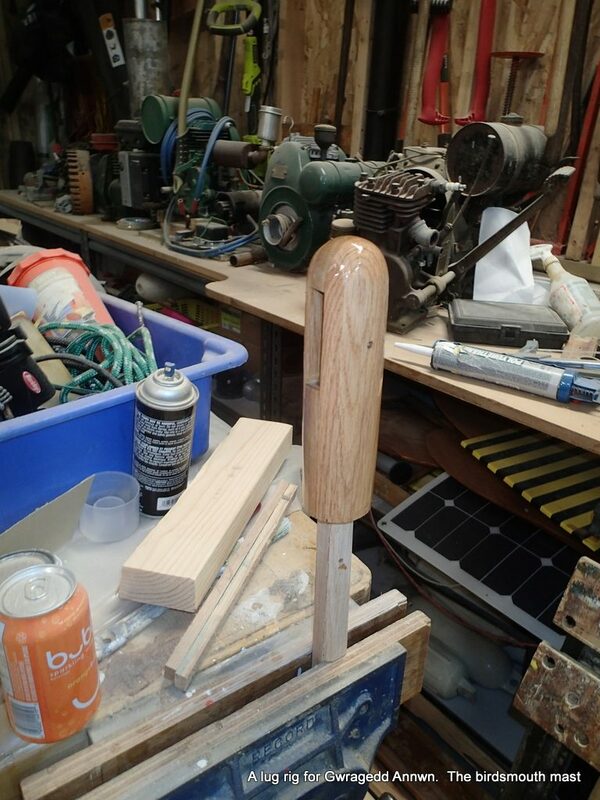 After the epoxy cures, the next step is to give the mast and masthead plug a light sanding, then varnish them. 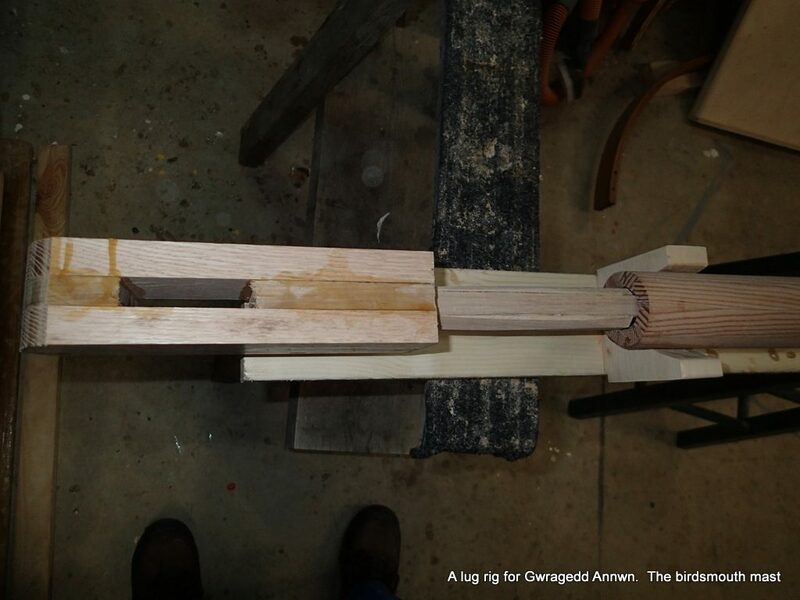 It will be easier to varnish the plug and the mast in the rotating rig separately. I will glue them together after a few (too many) coats of varnish have been applied…probably one a day for a week or so. Good rowing to you…and always know where you are.